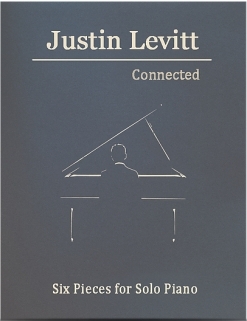 Connected - Six Pieces for Solo Piano, Volume 4 is the fourth volume of an eight-part series of piano solos composed by award-winning SF Bay Area composer Justin Levitt. Each volume includes six pieces, all quite different from each other. To show you the diversity: the title piece is lyrical and optimistic; “Anime” is playful; “Dakota” has an Americana style and spirit; “Crazical” is, well, a bit crazy and fun; “The Last Night” is soulful and melancholy; and “Snow White and the 8th Dwarf” is funky and bluesy. None of these pieces are simple to play, but they are all worth any effort required to master them. They are all fresh and contemporary without fitting into any specific genre (except the one Levitt has created called “Life Music”) and pianists at any age will find much to enjoy. 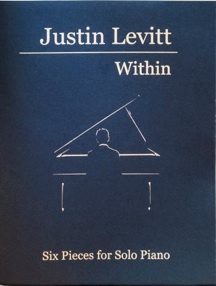 Levitt has included a description of each piece near the beginning of the book that gives the pianist valuable insight into what he had in mind when he created the music. All of the expression and playing instructions are in English; metronome settings and pedaling are indicated and clearly marked throughout the book. Any reaches of more than an octave are within broken (rolled) chords, so huge hands are not required. Some of the pieces are in complex key signatures (see below), which will give advancing students a chance to work in those keys with music that is fun to play - good incentive! The pieces are placed in the book by order of difficulty. The book itself is beautiful! The covers are a gray linen-textured cover stock with silver type and an elegant silver line drawing of a pianist that is expressed with only a few lines. The book is in the traditional 9”x12” format and the music is printed on a creamy paper stock. The printing is clear, roomy, well-spaced, and very easy to read. The books are stapled and are easy to keep open on the piano. All four of the volumes in the series that have been released so far are excellent, and I highly recommend them. 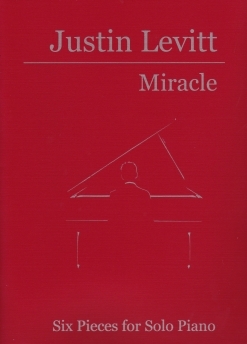 They are available from www.JustinLevitt.com.